The best Chicago area face painting, at the best prices. Thanks to the quality of our face art, we offer your guests a much more memorable and exciting experience than what you’d get from a magician, clown, balloon twister, or almost any other face painter. Scroll down for special discounted pricing. Hire us to make your party truly unique and full of energy. Your guests will think you spent a fortune on our artists. It’ll be our little secret about how much you actually saved versus most of the other party entertainer options. Our normal rate is $200/hr per artist, which is about the same as most face painters and clowns. But for a limited time, see special discounted prices below. We recommend 6 to 8 faces per hour per artist. However, our artists can go as high as 12 to 16 faces/hr if we slightly reduce the complexity of our designs. Each of your guests can select from a face art book containing our exclusive, most popular designs. We can do special requests and themed designs. Now that many of our artists are home from college, we are pleased to offer sensational summer rates. Book us an you will be helping local college artists earn money for school. You save 50% = $200! You save 55% = $440! You save 40% = $160! You save 50% = $400! You save 40% = $240! Please Note: We have a team of face painting artists available across the Chicago Metro area. Last minute requests are welcome. We also have the ability to accommodate large events. Check out a partial list of past clients on our See Us page. Now serving the Kenosha, Wisconsin area! Our face painters & balloon sculptors are friendly and skilled at engaging young participants. We are insured and can give you a certificate of insurance should you require one. We come to your event with books filled with images participants may choose from. We are happy to accommodate your theme with special artwork. If there is a special image that you want, just show us a picture and we will duplicate it. Most of our team members are talented students working to earn money offset their college expenses. We use gems and glitter to embelish our artistic creations. The recommended number of faces listed above allows us to face paint any design requested by each of your guests, including special requests not shown in our book of face paint designs that we allow your guests to review. The actual number of faces that can be painted will vary slightly depending upon whether all the kids are able to sit still. Squirmy kids make face painting slower because we have to start and stop frequently in order to maintain top quality end-results. Squirminess can be a particular challenge for kids under age 2, so we recommend cute cheek or arm art instead of full face painting for the little toddlers. We have tons of experience providing face painters and party ideas for all types of private, community and business events. We have enough highly talented artists to face paint from 10 to 1,000 guests of all ages at a single event. 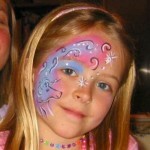 We use Snazaroo face paints, which are hypoallergenic and easy to wash off. Ask us about craft projects… a great way for kids to make their own party favors. We also offer balloon sculptors for added kids party fun. Don’t miss out – reserve your date as soon as possible. Last minute inquiries are welcome. We’ll do our best to meet your needs. Free quote – contact us with your kids party ideas and details.